Nayan, i wanted to talk to my mother regards money matter and i would like to have a positive reply. 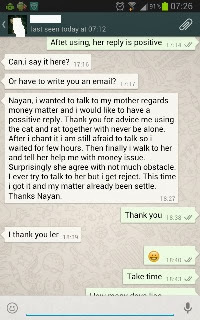 Thank you for advice me using the cat and rat together with never be alone. After i chant it i am still afraid to talk so i waited for few hours. Then finally i walk to her and tell her help me with money issue. Surprisingly she agree with not much obstacle. I ever try to talk to her but i get reject. This time i got it and my matter already been settle. Thanks Nayan.